This Strawberry Steak Salad is easy to throw together, perfect for lunch or dinner and a great way to repurpose leftover steak. 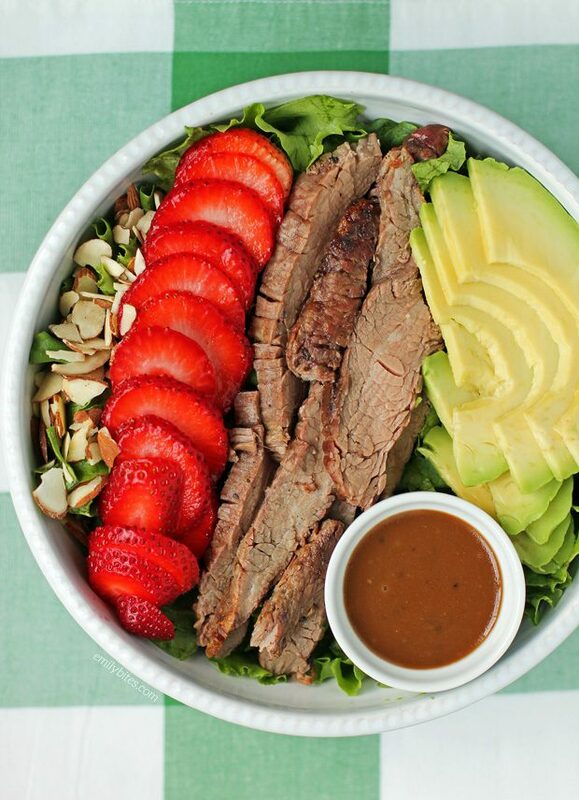 There’s something about steak and tangy balsamic dressing that just pairs beautifully together and with sweet strawberries, creamy avocado and crunchy sliced almonds, this seemingly simple salad may just knock your socks off! I used grilled flank steak for this salad which I highly recommend, but you can definitely use a different type of preparation method if you prefer (may affect nutrition info and SmartPoints). Not only is this Strawberry Steak Salad a delicious flavor explosion, it’s also super filling and just 340 calories or 8 Weight Watchers SmartPoints per serving! As with all salads, if you’re not using all four servings of this Strawberry Steak Salad at once, make sure to build the servings you are using and then store the different salad components separately, undressed. Then when you’re ready to make additional servings everything will still be fresh and ready to go. The steak can be served hot or cold on this salad, so do whichever suits your preferences! For more light and tasty salad recipes, check out my Southwest Steak Salad, Pepperoni Pizza Salad, Asian Sesame Chicken Salad, Roasted Beet Salad, Broccoli Salad, Avocado Bacon Corn Panzanella Salad, Butternut Squash Quinoa Salad, Antipasto Salad, Harvest Apple Salad, Doritos Taco Salad, Greek Orzo Pasta Salad, Chicken Souvlaki Salad and many more in the salad section of my recipe index! 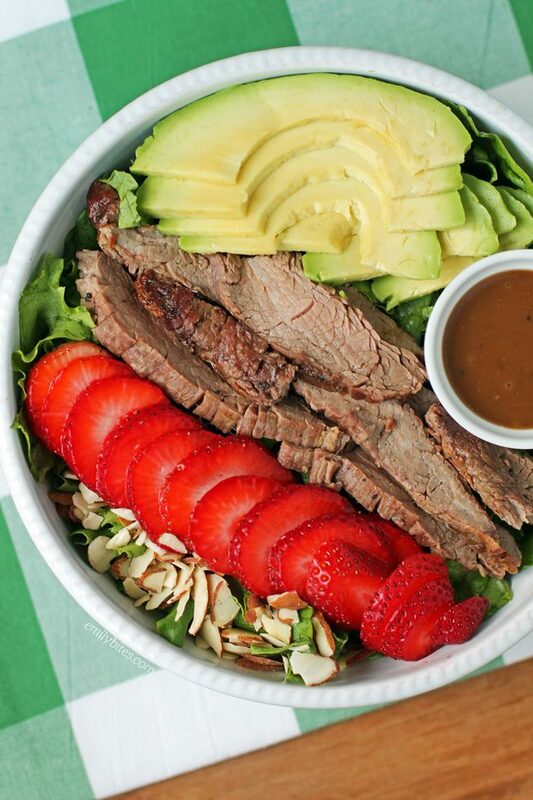 To build each salad*, place 3 cups of lettuce into a bowl and top with 2.5 ounces of the steak, 1.5 ounces of avocado, 1/3 cup of the strawberries and a tablespoon of sliced almonds. Toss or drizzle with two tablespoons of dressing and serve. *Build each salad to serve! If you’re only serving one or two salads, dress the ones you’re serving and store the leftover components separately and the remaining dressing in an airtight container in the fridge. Who made this, Rachel Green? Meat? Good! Strawberry? Good! Avocado? GOOOOD! OK, Friends reference aside, I had never seen this before haha looks interesing though.